Home » Spaghetti Pie is Better Made with Bucatini | Your Whole Family Will Love It! 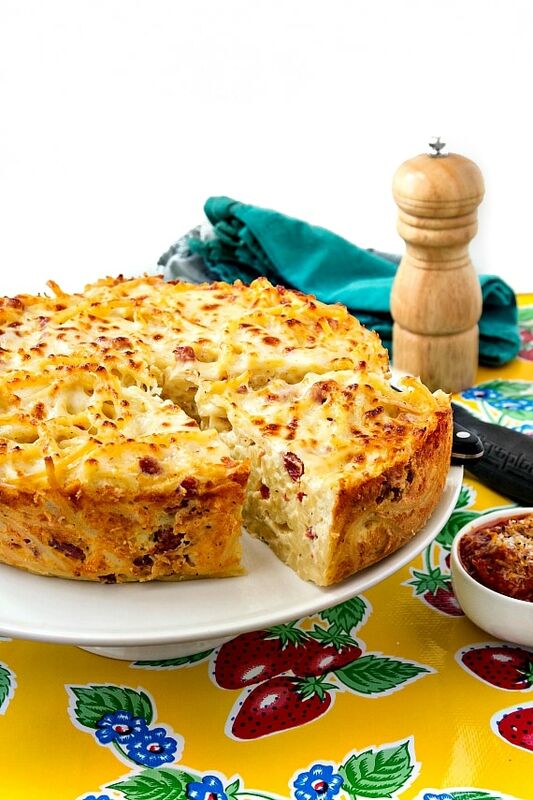 Spaghetti Pie is Better Made with Bucatini | Your Whole Family Will Love It! 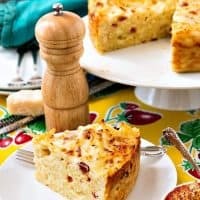 The best spaghetti pie is actually bucatini pie. Packed with cheese, eggs, and soppressata, it’s a fun and different way to serve pasta! Bucatini pie with marinara sauce is most often called “spaghetti pie” and is made with spaghetti. I prefer the heartier long, straw-like noodles of bucatini. Either way, you are going to love this recipe. The Beloved and I lived in Florida from 2000-2008. During our first years in Florida, our weekend morning routine consisted of getting up…whenever…making coffee and then parking ourselves in front of the television for some food television or maybe some home and garden television. We would gather all sorts of ideas for Things To Do to improve our palates or our yard. We’d talk about them, and then we’d never do them. All of our ideas were virtual, so in our minds, we executed them perfectly. Our yard was an oasis with a fire pit and a grotto and a flagstone patio and a pergola and an outdoor oven and a wading pool and a sculpture garden and a zoo. Our virtual pantry was filled with exotic flavored oils, only the best tomatoes, pasta extruded through rough bronze die that had been blessed by virgins by the light of the full moon. We had a cheese drawer filled with the finest hand-crafted cheeses, some wrapped in grape leaves or bathed in wine or liquor or dappled with dusty mold. Our spices were all whole and fresh and organic, and we ground them in our one of a kind mortar with a pestle hand chiseled by an indigenous Peruvian man named Anselmo. This was how we lived when we drank our coffee. Once the coffee cups were drained, though, a strange anti-magic happened. Looking out the sliding glass doors to the back yard, there was only a small concrete pad, a tall, spindly schefflera, and a couple of sad plumeria who didn’t enjoy growing in sand. And the pantry was full of…boring pantry stuff. 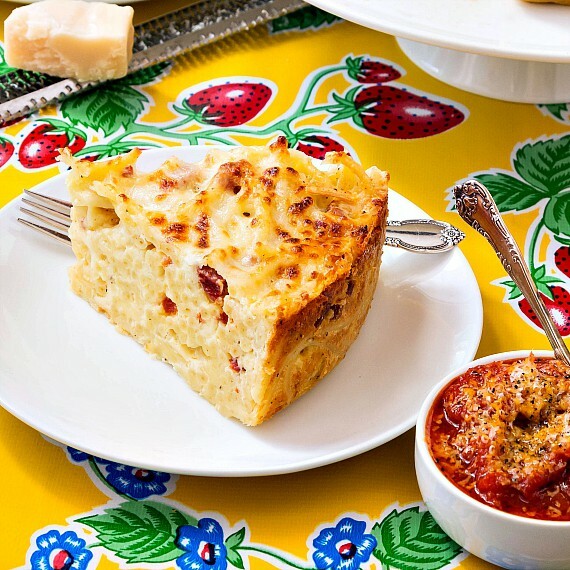 One of the meals we saw prepared on one of those food television shows years ago was this spaghetti pie, a recipe ostensibly developed by Martha’s friend Eleanora. Martha told us Eleanora came up with it as a way to use up leftovers, but I don’t know anyone who calls 12 oz of sopressata “leftovers.” Regardless, I’ve been dreaming about making this pie for years. It sounds silly, I know. It’s not hard to make. In fact, it’s really easy, but for some reason I just never got around to it. Until now. And it was so worth the wait. Using bucatini gives the dish a bit more substance than spaghetti, and I think it also slices more beautifully too. Plus, bucatini is my favorite. They’re like edible bendy straws. I may not have a grotto or an Anselmo-made mortar and pestle, but by crackie, I have this pie. And now you have it too. I did make a few changes to the original, which is linked in the recipe. Make Eleanora’s pie or make my version of Eleanora’s pie, a bucatini pie. But do make this–it’s great for a crowd and is equally good hot or at room temperature. Enjoy! This hearty and filling bucatini pie is pure comfort. Served with a side of intense tomato sauce, this dish is perfect to feed a crowd on game day or any day. The marinara is a mash-up between Marcella Hazan's beloved recipe and a great one from Fabio Viviani. It's what I use for everything from spaghetti to pizza sauce. Spray a 9" or 10" springform pan (or deep cake pan) with pan spray. Put a circle of parchment in the bottom of the pan. Set aside. Bring a large pot of water to a rolling boil. Salt it well and cook the pasta to al dente. While the pasta is cooking, mix up the cheesy goodness. In a large bowl, evenly and thoroughly combine the 1 pound of mozzarella, ricotta, Parm, Asiago, beaten eggs, milk and seasonings. When the pasta is al dente, drain and run some cold water over it. You don't want to chill it, but you do want to take the edge of the heat so your eggs don't cook too soon. Drain the pasta very well after rinsing. Gently but thoroughly stir the bucatini into the cheesy goodness. It will take some doing because the cheese mixture is pretty stodgy. That's okay. Keep at it until everything is nicely combined. Scoop the cheesy pasta into the prepared pan, trying to spread it as evenly as possible. Press it down a bit so there are no big gaps or air pockets. Cover the pan with foil. Bake in the center of the oven for 40 minutes. Remove the foil and bake an additional 20 minutes. Evenly sprinkle on the remaining mozzarella and broil for 2-4 minutes, watching carefully, until you have a lovely, bubbly top with lots of dark golden brown crispy spots. Remove from oven and run a knife around the outside of the pan. Allow to cool about 10-15 minutes and then remove the sides of the pan. Serve hot or warm, or even at room temperature, with a side of the marinara sauce, which you either made ahead or made while the bucatini pie was in the oven, right? Over medium heat, melt the butter and oil together. When the butter is sputtering, add the garlic. Swirl the pan and watch carefully. You want the garlic to turn a medium golden-to dark-ish brown but not burn, so be careful. When it starts to go, it goes fast. When the garlic has some lovely color on it, pour in the tomatoes all at once. Add the salt, pepper and optional pepper flake. Chances are it will taste a little flat at this point, but you'll be reducing this for a long time so under-seasoning is preferred. You can correct at the end if necessary. Cook the tomatoes, stirring occasionally and breaking up the tomatoes into smaller and smaller chunks, until the sauce is very thick and is starting to stick to the bottom of the pan a bit. It will also darken in color to a deep, intense reddish-orange. This whole process could take 45 minutes or so, so don't rush things. Once the sauce is thick and perfect, taste and adjust the seasonings if necessary. Serve hot or warm with the bucatini pie, or use it for pretty much whatever you want. Thanks for joining me today for a hearty slice of bucatini pie (or spaghetti pie, if you must) with a side of intense marinara sauce. I know you will love it. Swooning! 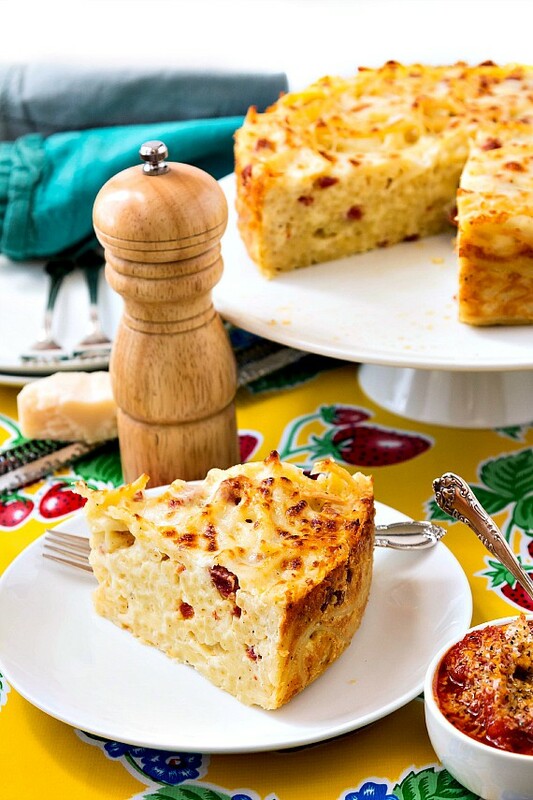 I love this and adding the marinara sauce to a pasta and cheese baked dish is wonderful. And magic. I also love the addition of sausage. Yeah, you are magic. This has got to be the ultimate comfort food! I am italian and adore spaghetti pie but I cannot express how much better bucatini works. The density of the noodle makes a huge difference. I actually use bucatini when I make mac and cheese. It come out like a pie and everyone loves it. I also must say that YAY san marzano tomatoes, this is all I use when a recipe calls for canned tomatoes. They are so much better and sweeter too. Planning a gathering this weekend to welcome some spring weather here finally! Were supposed to see 70 so we are all praying for it. 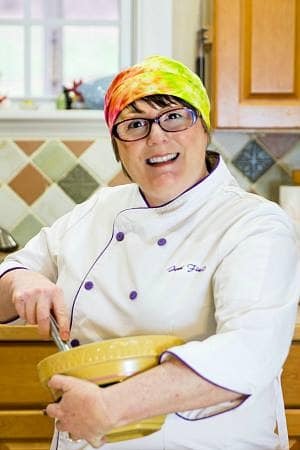 I am contributing your spaghettii pie and knowing my friends I plan on making two. Thank you so much for the awesome idea, I cannot believe I never thought to use the bucatini here. Just Fabulous! Oh, hooray! I am so glad you love the idea! I hope you and your friends get the 70 degree temperature you’re praying for and that everyone enjoys the pie. And thank you for the Mac & cheese idea! Totally stocking up on bucatini once I’m done with my Whole30!